Tired of doing sweatshirts? Looking for something a little bit more trendy to try your hand at? How would you like to make a garment that didn't feel bulletproof when you were finished with it? We offer solutions to all of these and more with Designer Roses. Learn what techniques top industry designers are using on their garments, (plus a few of our own), to create stunning garments that look like you paid a fortune. 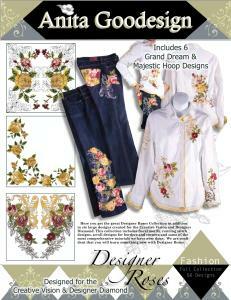 Pocket embroidery, distressing, customizing, attaching embroidery to denim without hooping and much more. This collection includes floral motifs, running stitch designs, scroll designs for borders and corners and some of the most comprehensive tutorials we have ever done. We are confident that you will learn something new with Designer Roses.